Fiji is a cluster of 333 tropical islands and is home to almost one million of the happiest, friendliest people on Earth! Bamboo is designed to be a budget traveller's base and launching pad into this amazing country. We are a showpiece for Fiji island life and culture and we present an alternative to the mainstream backpacker scene in Nadi. In a nutshell, Bamboo offers a free 24-hour airport pick-up, free Wi-Fi and free kava parties. Our location is in the heart of Nadi's backpacker beach and only 10 minutes' drive from the international airport. We have a travel hut for island trip planning with local promotions offered as well as fun, cheap day trips to 'The Sleeping Giant' and Natadola Beach'. There’s also weekly fire dancing shows, kava parties, daily volleyball sessions, table tennis challenges, live acoustic Fiji-style music every night and delicious island food at our 'Café Bamboo', featuring daily specials and traditional Fijian cuisine. We offer a variety of clean and comfortable rooms with free luggage storage. Travellers from all walks of life are welcome. It’s a great place to meet people. Relax under a huge traditional Fijian thatch hut, swim and play down the sandy stretch of Wailoaloa Beach, swing in a hammock and enjoy the tropical surroundings. Prepare for good times! Surrounding attractions include Smugglers Cove (for dining, swimming, drinking and fire dancing), Travellers Beach (for dining, drinking and live music), Aquarius Fiji (for dining on the beach), Martintar shopping district (for cafés, restaurants, and night life) and Wailoaloa Beach (long sandy beach for swimming, horse riding, volleyball, etc.). Plus tons of other fun and exciting stuff! Leuk hostel, goede sfeer. Keuken is 24/7 open net als de receptie. Heeft een leuke bar en een gemoedelijke sfeer met gezellige mensen en genoeg entertainment. Het meest levendige hostel in nadi. 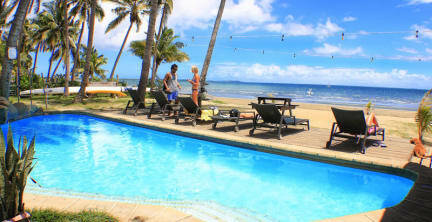 Good place to start/end your stay in Fiji. There's no kitchen for guests! Laundry will be done for you, I paid 6fjd for 2kg. Try to book your trips directly/in town to save money. Try to get yourself in the Blue Water building which has a nice garden with pool. You get what you pay for! Beach is awfull and the rooms, bed and showers were not very clean. Great to meet amazing people, bonfires on the beach and food is mostly very good. Geen hostel voor mij. Maar als je into hippies bent is dit perfect. Locatie is oke aan t strand. De drankjes en het eten zijn goedkoop. Echter wacht je ontzettend lang erop. Dat heet fiji time! Badkamers zijn niet schoon. Daarentegen zijn de kamers oke. Geen stapelbed. Eigen stopcontact, kluisjes. En geen airco. Ik houd daarvan. Worst travel desk I’ve ever been to. I booked a tour there and everything was fine. But when I called later for further information about the tour, it turned out I was going to a whole different place. When I confronted them about it they acties really unkind and accused me of making it up. I almost booked an airplane ticket, which would’ve taken me to the wrong place. Don’t book a tour here!